← Can you spot the caterpillar? 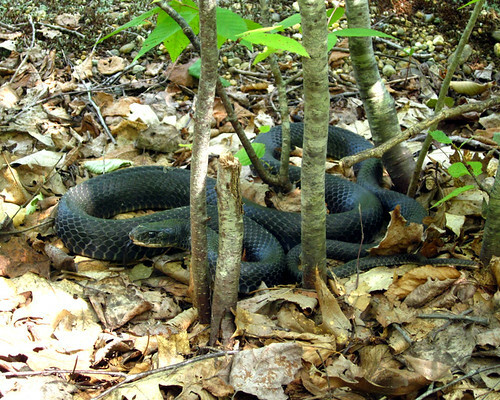 Black racer (Coluber constrictor). I first saw this snake under a large rock, surrounded by fluff that appeared to be bits of a mouse nest. 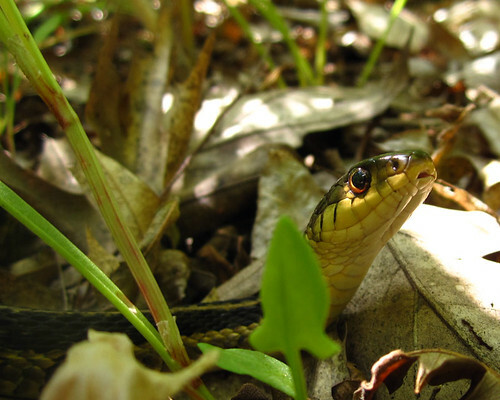 Being the hands-on naturalist that I am, I gently poked at her with a twig until she slithered out from under the rock – striking at me a few times in the process. I followed her until she settled, coiled, poised to strike, continually planning her escape. She kept an eye on every movement my friend and I made. I was amazed she sat still at all instead of escaping right away! Once she was out from under the rock all we did was follow her at a distance until she stopped. After a few minutes of picture taking she saw our poses relax slightly, and she raced off (ha! see what I did there?) into the woods. I was tempted to catch her, but decided I’d rather get some good photos than come home covered in blood and snake musk. Perhaps another day. And a lovely little garter (Thamnophis sirtalis). My friend tried to catch her and missed, but she still musked. We decided to leave her alone and try to take photos instead. I managed to snag this one through the undergrowth. Snake hunting is always a fun break on a warm sunny day. Posted on July 12, 2011, in Vertebrates. Bookmark the permalink. Leave a comment.